Dip me in that batter! At Batter'd and Fried there is no good reason to not indulge. From amazing New England-style fried seafood to fresh sushi, this place has your seafood craving covered! I lived in New Orleans and Boston, so I know damned good seafood. I was skeptical about this place, and combining New England style fried seafood and Sushi in the same restaurant seemed a bit too culinarily unorthodox. But I am obliged to say, that this place delivered beyond my expectations. There were items which were missing, but given that Nashville is pretty far from the waters off the coast of New England, it's understandable. But it's the quality of what they had which stunned me. Even picky Bostonians would like this place, but the Sushi was damned good as well. To say the least this is NOT a Captain D's!! What more needs to be said....I have even gotten where I like the sushi. Good place to eat. Awesome Boston Seafood House with Amazing Sushi! We have been great fans of Batter'd & Fried since the month they opened. It's hard to believe that it's been about four years already! Batter'd & Fried is located in 5 points in East Nashville. It's a fairly small casual restaurant with the added benefit of outdoor seating for the pleasant months. While the Boston Seafood is great, that's actually not our favorite part of the restaurant - it's the sushi! It's amazing, because to walk in the place you'd not necessarily think that; it just looks like a casual fried seafood house...who would think to get the sushi instead? But you SHOULD. We've eaten in several of the best sushi restaurants (by reputation) in Nashville, and Batter'd & Fried definitely is right there with them in quality. And the staff is SO friendly and cool. Many of them know us by name. While we order different pieces when we go, we almost ALWAYS order the five points platter. 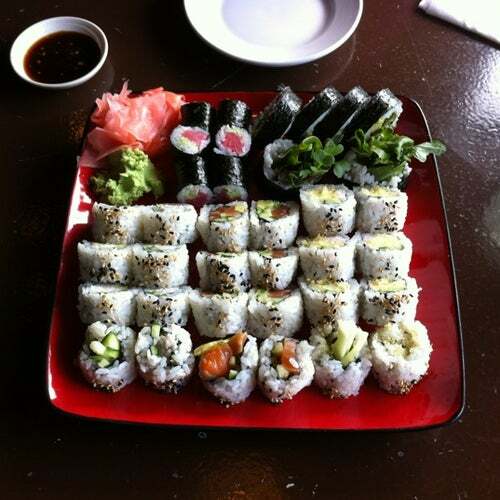 There are five rolls on the platter and it's an excellent value, about $35. The head Sushi chef starts making one as soon as she sees us walk in the door. We walk up to STOP her on the rare occasion we're NOT going to order that. But that's Batter'd & Fried for you - they KNOW their locals and they always take great care of us!